By buying this product you'll earn up to 875 Rewards points. 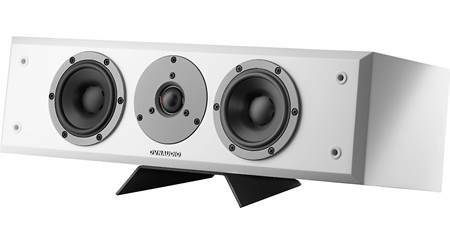 Planning a Monitor Audio surround sound system? 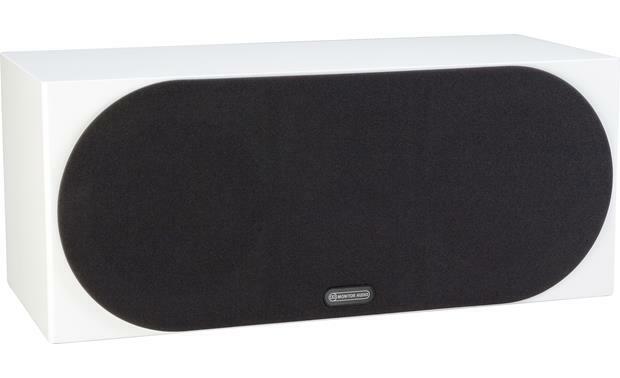 The Silver C350 center channel speaker is the ideal choice as the centerpiece of your system — especially if you have a large room. 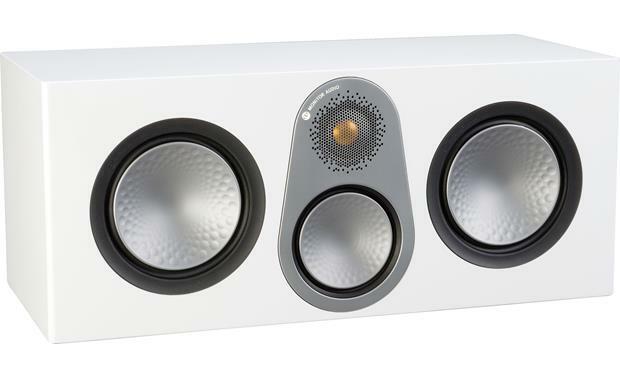 It features a three-way design, which sonically matches Monitor's other three-way Silver Series speakers (Silver 100, Silver 300, and Silver 500). The warm, natural sound of the Silver C350 is in part due to its carefully designed rock-solid enclosure, which resists vibrations that can color sound and reduce clarity. Its sealed design lets you place it inside an entertainment cabinet or position it close to a wall, without worrying about speaker ports needing to "breathe." 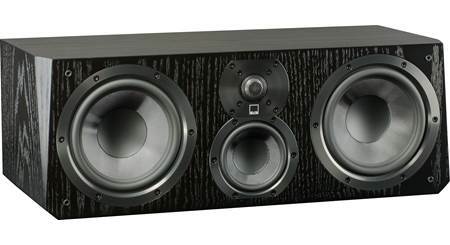 This handsome center channel is available in a variety of real-wood veneer and high gloss finishes. The Silver C350's 1" gold dome tweeter is positioned above a dedicated 4" midrange driver, which combine for crystal clear dialogue. Low-end punch comes courtesy of two beefy 6" woofers, which allow the C350 to produce satisfying bass and lifelike center-stage sound effects. An advanced crossover network ties the drivers together and ensures smooth, full-range sound throughout the speaker's frequency range. 3-Way Center-Channel Loudspeaker: Monitor Audio's Silver C350center-channel loudspeaker utilizes a 3-way driver, 4-driver configuration with a newly designed 1" C-CAM Gold Dome tweeter, specially developed 4" C-CAM RST midrange driver, and two new 6" C-CAM RST midbass/bass concave "dished" woofers. This 3-way, 4-driver configuration allows each driver to be optimized to do a better job over a narrower frequency. What makes the Silver C350 even more special is the vertical orientation of the mid and tweeter axis which delivers the same directivity as the other speakers in the Silver Series line-up, while the pair of 6" woofers produce powerful midbass/bass. 4" Midrange Driver: The Silver C350 produces natural midrange courtesy of a dedicated 4" C-CAM RST midrange driver, specially designed with a "under-hung" voice coil and motor system. This technique ensures the voice coil always remains in the magnetic gap under all conditions for lower distortion. Dual 6" Woofers: The ultra-compact Silver C350 introduces a completely new version of Monitor Audio's special 6" C-CAM RST woofer with a concave "dished" cone profile for optimal damping and improved midrange clarity. The two 6" woofers are constructed with massive magnetic systems and cast polymer chassis capable of deep bass extension with excellent rigidity and damping characteristics. Each C-CAM woofer also utilizes a unique build ring/voice coil-cone coupling mechanism (DCF), optimized to reduce high-frequency cone break-up and increase the critical voice coil circumferential rigidity. High Quality Crossovers: The Monitor Audio Silver C350 employs high-quality crossovers (LF/MF=830Hz, MF/HF=3.2kHz) with premium grade, bespoke polypropylene film capacitors, air-core and low-loss laminated steel-core inductors to seamlessly blend the sound of the tweeter, midrange driver, and woofers together for a natural sounding audio image. Pureflow silver-plated OFC copper internal cabling means the highest-quality transfer throughout the signal chain. C-CAM Cone Midrange/Woofers: Ceramic-Coated Aluminum/Magnesium is used to construct the woofer cone in the Silver Series loudspeakers. C-CAM is a material originally developed by the aerospace industry for jet engine components. Its properties are ideal for loudspeaker cones being extremely rigid, yet light enough to yield high overall efficiency. In manufacture, aluminum/magnesium alloy undergoes a three-stage stress-relieving process to remove surface deformation and molecular weakness. Once formed, the alloy cone is subjected to a high temperature anodic coating process in which a layer of pure ceramic alumina is depleted onto its surfaces to a depth of 100 microns, producing a completely rigid sandwich of alloy and heat-dissipating ceramic material. Conventional cones are liable to flex or twist in operation, producing a significant level of audible distortion. C-CAM cones have a much higher resistance to bending stress and therefore exhibit much greater fidelity over their entire operating range. Rigid Construction: Strategic cabinet bracing and Monitor Audio's bolt-through technology creates an amazingly solid speaker. Not only can it play louder and cleaner than its size suggests, it delivers an incredibly well balanced, pure midrange for a natural sound. Design criteria ensure that the Silver C350 will make the most of smaller living spaces by being placed close to a wall and yet still deliver clean, punchy bass. 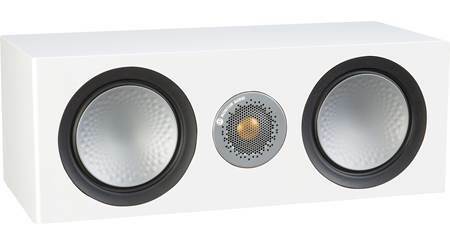 You will only hear well-balanced, pure midrange without ever a hint of box coloration. 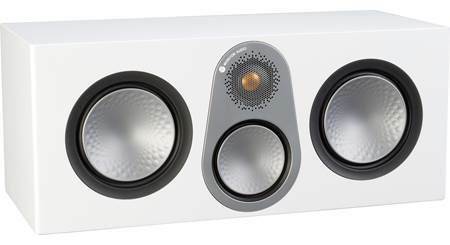 MDF Sealed Enclosure w/ Magnetic Grille: The Silver C350 employs a MDF sealed enclosure for accurate, uncolored sound. Rigid 20mm MDF construction is used throughout the enclosure with radial and cross-bracing techniques for high rigidity and low cabinet coloration. In addition, the center speaker comes with an acoustically transparent magnetic cloth grille. Dual Gold-Plated Binding Posts: The Silver Series bookshelf loudspeaker has two sets of gold-plated binding posts connected by wire-jumpers. The gold-plated binding posts will accept bare wire (up to 10AWG), pin connectors, & banana plugs (single only). To use banana plugs, you will need to remove each binding post's plastic insert. Using the dual posts, you can bi-wire or bi-amp the speaker. Bi-wiring or bi-amping the speaker provides improved bass & treble performance. Applications: The Silver C350 center-channel loudspeaker has been carefully tuned to match the timbre of the other speakers in Monitor Audio Silver Series line-up, resulting in a consistent sonic character across the front channels of a home theater system. Placement: The Silver C350 center-channel speaker should be centered above or below your TV, and positioned so that it is pointing directly at the main viewing/listening area. Ideally you want the center channel to be approximately at ear-level when seated in the main viewing/listening position. Mounting Options: The Sealed cabinet of the C350 provides accurate performance when installed in an AV cabinet. The center speaker comes with self-adhesive rubber feet to prevent movement and vibration on top of a table, shelf, or stand. The rubber feet add approximately 0.125" to the overall height of the speaker. An optional universal wall-mount bracket from PinPoint is available and sold separately (see accessories tab). Searches related to the Monitor Audio Silver C350 Center channel speaker.